Tree frogs are any of the species of frogs belonging to the taxonomic family Hylidae. As their name indicates, they are perfectly designed for arboreal life. They have slender lightweight bodies and long toes with sticky toe pads that help them climb in trees and cling to branches and leaves. They also have extra cartilage between the last two bones of each toe that makes their toes more flexible. Tree frogs come in a variety of sizes and colors. Most species live in trees, but there are some species that spend most of their time on the ground and some species that spend most of their time in the water. Most species eat insects, but some larger species may eat small vertebrates. A picture showing the life cycle of a frog. A distribution map of the family Hylidae. Hylidae is an extremely large and diverse family of tree frogs. It contains four subfamilies, approximately 38 genera, and over 700 species. Members of Hylidae can be found all over the world, with hylids located throughout temperate North America and the neotropics, including the Caribbean islands. Hylids are also widespread in Australia and Papua New Guinea. The genus Hyla is found in temperate Eurasia, Japan, and the northern tip of Africa. Hylids usually feed on insects and other invertebrates, but some larger species can feed on small vertebrates. This is a video giving people a look at the red-eyed tree frog. ↑ New Hampshire Public Telesvision Gray Tree Frog. Web. Date-of-access February-12-2013. ↑ Red-Eyed Tree Frog National Geographic. Web. Accessed February 12 2013. Author unknown. ↑ How Stuff Works Tree Frog. Web. Date-of-access February-12-2013. ↑ New Hampshire Public Television Gray Tree Frog. Web. Date-of-access February-12-2013. ↑ Heather HeyingHylidae. Web. Date-of-Access February-12-2013. 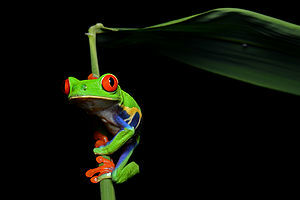 ↑ Rainforest AllianceRed-Eyed Tree Frog. Web. Date-of-Publication 2002. This page was last modified on 29 October 2015, at 19:21.